I’ve never met a marathoner who didn’t start out with one mile. And I’ve never met a bibliophile who didn’t read as a kid. Practice is so important to everything we do in life. But struggling readers – especially at the high school level – probably don’t have a lot of experience with reading. Historically, it’s been a challenge, and so it’s become something they are good at circumventing. Taking a Hi-Lo approach to reading, even in the upper grades, will help to both foster a love of reading and teach those reading skills that are necessary for even the most basic of careers. It provides students with a sense of empowerment and confidence as they tackle the challenge of becoming a better reader. Typical high school texts assume that the student has already mastered these skill. Therefore they are often too advanced for struggling readers to comprehend. By taking the Hi-Lo approach, students can read engaging material. These books provide many of the concrete details that are yet unable to supply through inference. Just by reading the back of a book, knowing the title, seeing the cover, flipping through illustrations, or skimming the first few pages, you are probably able to tell what’s going to happen in a novel, right? This is predicting, and it’s a critical first step. Unless you can predict what might happen, and then check to see if it meets your expectations, you are not invested in the text. Likewise, summarizing is a task that will keep you invested in the text. Checking in with your students every so often to be sure that they understand what is happening will help to keep them on track. This can be a difficult task for many struggling learners. So ask leading questions to help them remember details. In addition to predicting and summarizing, making inferences is a necessary skill, yet one that requires the development of abstract thought. This is your ‘reading between the lines’ skill – the one that takes in body language, emotions, surrounding circumstances, and couples them with the action to figure out motivation and untold backstory. This is also where the majority of confusion comes in for struggling readers. The amount of inferring needed is what separates the basic from difficult texts at the upper grades level. A high interest-low level book (hi-lo book) is a chapter book of easier readability, but with characters that are older and topics that aren’t considered ‘babyish’ by the struggling reader. While there are many fantastic hi-lo reading choices for the elementary level – such as High Noon Books – few exist for high school. What options do exist for these upper grades are financially-prohibitive for most homeschool families. Given how few options there are for struggling readers in the upper grades, we’re taking books that fit into the “high interest-low level” role (but aren’t actually ‘hi-lo’ books), and using them to expand the reading level slowly. We’re able to teach history, geography, and science through an engaging story that holds their interest. One example of this would be the battle-themed books in the We Were There series , such as Caesar’s Legions, Battle of Bataan, and the nuclear-science themed Opening of the Atomic Era. These action-adventure novels are written at a 4th to 6th-grade reading level, yet are full of history and battle details! The activities and thinking questions reinforce reading comprehension, and the vocabulary and reading flow naturally improve with continued reading. All of our adapted Hi-Lo units are free and accessible for teachers and homeschooling families. They begin with a book, include some background / introductory material, and have hands-on activities, video clips, critical thinking questions, and writing activities included. You can access them – as well as see what’s upcoming – on our Book Studies page. 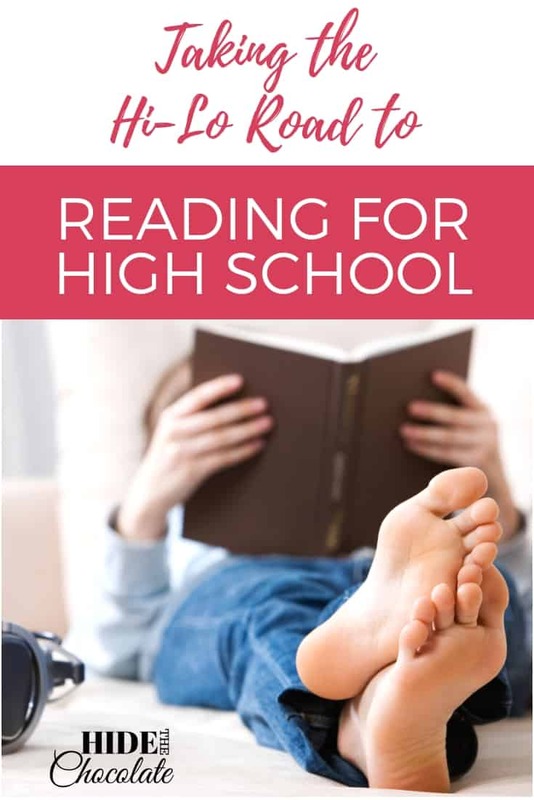 What book would you adapt for your high schooler? Yvie practices the art of simple living with her chickens, goats, dogs, rabbits, and house full of boys in rural America. She loves acoustic guitar, historical novels, and anything with dark chocolate!